Mariah grew up in rural Alaska, surrounded by forests, mountains, and creeks. She has always had an affinity for the outdoors and the wildness of nature. After high school, she moved to Southern Oregon and graduated from SOU in 2004, earning a degree in Environmental Studies with an emphasis in biology. In college she worked as part of a collaborative group studying my corrizal associations in Oak Woodlands. 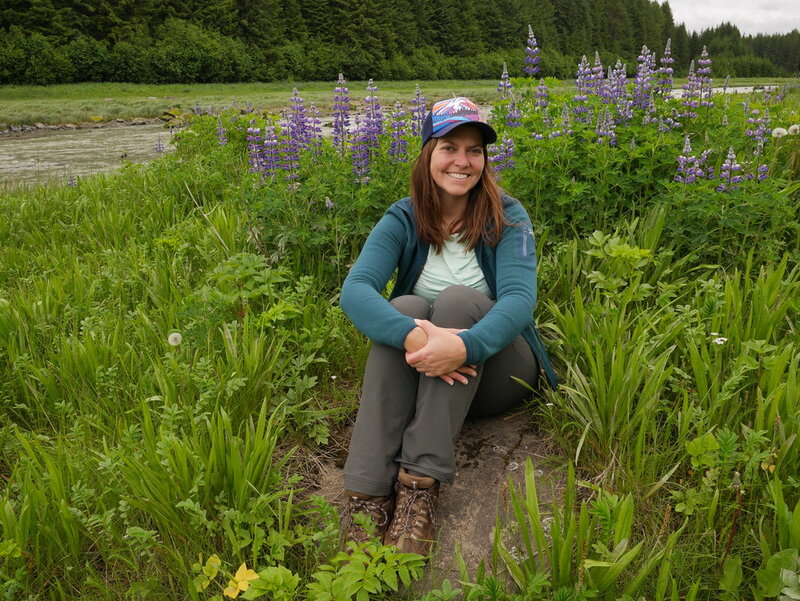 This sparked an interest in local ecology, and she has been conducting botanical surveys in Southwestern Oregon ever since. She has logged countless hours watching native bees foraging in oak woodlands and meadows, and has always had an interest in local plant and pollinator interactions. Alessandro Broido first discovered his love for nature and working with young people while volunteering in a rural Honduran community as a teenager. After building a life-changing relationship with his host family, he continued to work with the youth-leadership organization Amigos de las Americas for three additional seasons in Mexico, Ecuador and most recently in Costa Rica directing cross-cultural volunteer trail projects in Carara National Park. After graduating from the University of San Francisco Alessandro moved to the remote northwest corner of California where he deepened his love for the natural world. He spent two years in Del Norte County discovering new avenues for working with youth as a school-based mentor in the garden, woodshop, and ropes course. He also directed a summer trail crew of high school students removing invasive weeds in the Six Rivers National Recreation Area and led a Redwood Canopy Tour Zip Line. The following two years he spent working for the Smith River Alliance coordinating volunteer projects and counting salmon during the spawning season. Alessandro earned two graduate degrees, a Master of Science in Environmental Education and a Master of Arts in Teaching from Southern Oregon University. Today, Alessandro enjoys surfing, climbing, hiking, traveling, searching for reptiles and amphibians, and playing music. He teaches 4th grade at Jewett Elementary in a bilingual Two-Way Spanish Immersion classroom. Sarah has been on a windy journey that started around Providence, RI for childhood, stopped in New Orleans for school, Austin for the start of adulthood and finally landed her in Ashland, OR for a slower pace and a sense of community. Along the way, she obtained a Bachelor's in Cellular Molecular Biology and a Master's in Public Health from Tulane University. She is certified a project management professional and a public health informatics scholar. Sarah has worked in small non-profits, large state governments, and for profit technology companies. Most recently, she is a project manager at a techonology company that helps to ensure newborns receive all the care they need at birth. Throughout this journey, volunteerism has always been a very important part of her life. From throwing events to stuffing envelopes, Sarah is eager to help local non-profits thrive. Jenni grew up in Ashland, Oregon with educators as parents. Jenni attended Oregon State University originally for Physical Therapy, but figured out later she was really meant to be a Teacher. She continued her education at OSU earning her bachelor’s degree in Human and Child Development and later, a Masters degree in Education. After college, Jenni moved to Southern California to begin her teaching career and taught both 5th and 6th grades there for 10 years. She really does feel most “at home” in an elementary school working with kids. In the summer of 2012 Jenni and her family moved back to Ashland, Oregon so her so her own kids could experience the same educational richness she did. Jenni currently works as a 5th grade teacher at Hoover Elementary School in Medford, Oregon. She’s excited to be working closely with Sarah and the Bee Girl team to develop curriculum all about bees for classroom use. Scott is a graduate of The University of Montana Wildlife Biology program and has 14 years experience managing the research colonies for the University. He is currently pursuing a Ph.D. from the Division of Biological Sciences at The University of Montana. His research focuses on the movement of pollinators through the environments and the ecological patterns that influence their plant choices. He, of course, uses the Honey bee as the model species for this research. He has extensive expertise with honey bee ailments and pests, as well as an intimate knowledge of the insects that he is eager to pass on to others. Ash grew up in rural areas of Idaho and Montana. He is the Education Director for NTEN and has been in love with the nonprofit sector for over two decades. He has worked in the areas of conservation, environmental education, social work, youth program development, and nonprofit technology. He has an affinity for systems thinking, strategy and rooting everything in the ideals of building community. Ash earned a B.S. from the University of Montana in Resource Management and a Masters in Environment and Development from the University of Kwa-Zulu Natal in South Africa. He has spent the last decade working specifically in the nonprofit technology space in the areas of digital engagement, project management, e-learning and program development. Ash loves bees because of the essential role they play in connecting people and food but also because they are a critical indicator of how humans are impacting the world around them. A beautiful illustration of the current status of the give/get relationship between humans and their environment to help keep us in balance.